Item Number: 810-S315 18374 Actual Weight: 6 lbs. Keeps important papers organized while keeping dirt and grime out. 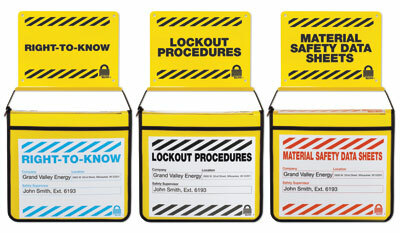 Use for MSDS, lockout procedures, right-to-know, ISO procedures and other paperwork you want to contain and organize in one central location. Can be wall mounted, placed on book shelves, or used with existing wire baskets. Included wall bracket contains labels for MSDS, lockout procedures, and right-to know in English, Spanish/English, and French/English.